Wedding fever is sweeping through Happy Valley this September! So assemble your bride tribe and grab your stags - this is one for everyone! Never one to stick to the norm we are taking the traditional wedding fair and turning it on its head & hosting our very own ‘WedFest’. 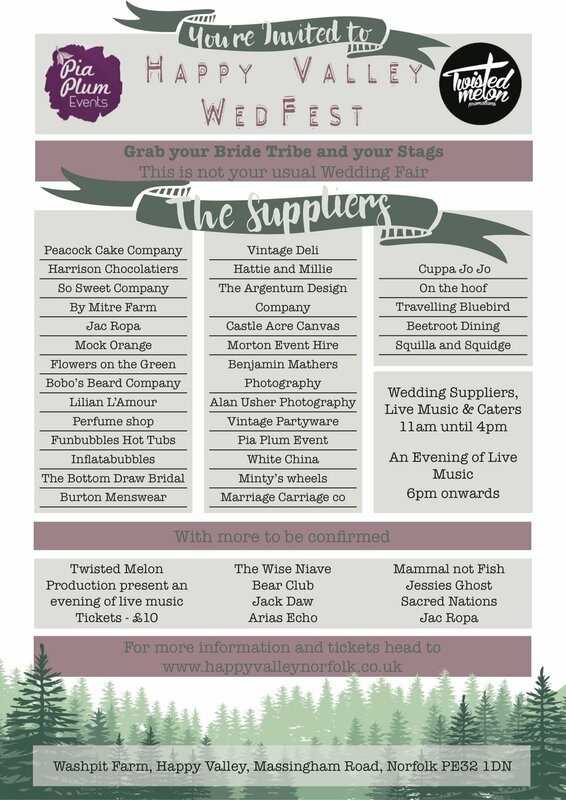 With all the essential Wedding fair elements and then some not so usual! The magical surrounds of Happy Valley, will give you a taster into your special day and then there is so much more for the whole family to discover! The gates to our truly unique venue open at 11am for a magical day of wedding planning for which, Pia Plum Events have enlisted the help of over 40 of their favourite suppliers. They will be available to show you their wares and discuss how they can create a day tailored to you. From Beard Preening to Props, Petal Confetti to Vintage Wedding Dresses. If it's a Hair Artist you need or a cake fit for the queen we have all the little extra’s you didn’t even realised you’d need. Castle Acre Canvas will be housing the Wedding traders in their beautiful multi peak capree tents. You can peruse the fabulous Norfolk Wedding suppliers and create your bespoke happily ever after or you can discover concierge services who will do all of it for you. As the sun starts to set over a wonderfully productive day, our venue takes on a new life, so have you dancing shoes at the ready and discover your perfect wedding entertainment as at 6pm the first band will be set to grace our stage. What better way to pick your wedding band than under our woodland canape, surrounded by friends with your favourite tipple in hand. There is free entrance and all are welcome to the wedding fair during the day 11am - 4pm. You'll be able to see the Glamping accomodation Happy Valley has on offer thus far before the big tree house build completes at the end of the Year. Huge Thanks to WE SIGNS for their sponsorship & wonderful signs you see throughout the roads of Norfolk.